THE HASHTAG FOR PRO TOUR IXALAN IS #PTXLN. JOIN THE CONVERSATION. SEE PT IXALAN AS IT UNRAVELS ON THE MAGIC: THE GATHERING FACEBOOK PAGE! Grand Prix champion, World Champion, and now a Pro Tour champion. Seth Manfield has long been regarded as one of modern Magic’s all-time greats, and today shows why. Armed with a Sultai Energy deck that his Genesis and Revelation teammates built for Pro Tour Ixalan, Manfield crushed the competition in Friday and Saturday to lock up his career fourth Pro Tour Top 8, joining fellow former World Champion Guillaume Matignon in a Sunday playoff that featured legends as well as Pro Tour first-time competitors. After battling through Guillaume Matignon’s Jeskai Approach and Samuel Ihlenfeldt’s Mardu Vehicles, Manfield faced off against Massdrop West’s Pascal Maynard in a final match that featured five games of intense action. In the final game, Manfield’s energy production and slew of card draw overwhelmed Maynard, who offered him a handshake and a hug in celebration of his victory. 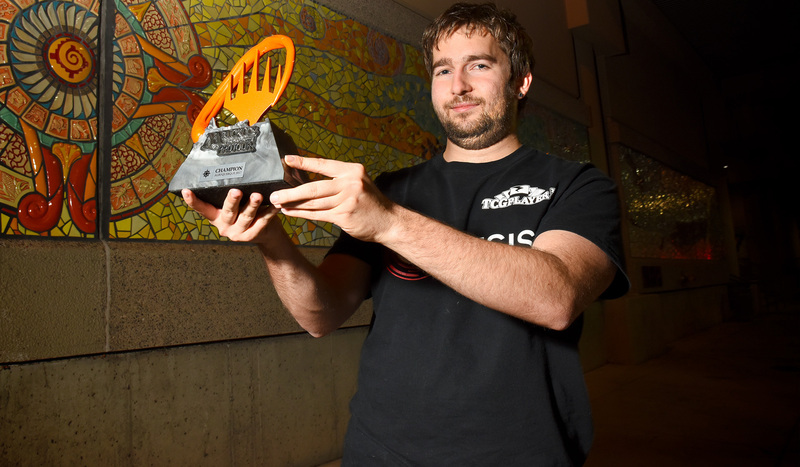 Since Seth Manfield’s first Top 8 at Pro Tour Fate Reforged, following a long series of successes at Grand Prix leading up to that moment, he has not slowed down, becoming a permanent fixture at the top tables of Pro Tours since. Today, he was at the top table until the tournament came to an end. Pro Tour Ixalan’s Top 8 boasts a wide range of experience, including former World Champions and a Pro Tour first-time competitor. Leading the pack is ChannelFireball’s Mike Sigrist in his third Pro Tour Top 8, joined by Phoenix: 404’s Christian Hauck in his first. Following that is Massdrop West’s Pascal Maynard in his second Pro Tour Top 8, along with 2015 World Champion and Genesis team member Seth Manfield in his career fourth. Rounding out the Top 8 is 2010 World Champion Guillaume Matignon in his third Pro Tour Top 8, alongside Poland’s Piotr Glogowski, MetaGameGuru Moon’s John Rolf, and Tower Games team member Samuel Ihlenfeldt in their first Sunday stage appearances. For Ihlenhfeldt, it is also his first Pro Tour, making this one to remember. Who will go on to become the Pro Tour Ixalan champion? Tune in Sunday to twitch.tv/magic at 8 a.m. PT/11 a.m. ET/3 p.m. UTC to see how it all unfolds! Poland’s Piotr Glogowski and Hong Kong’s Yam Wing Chun are the sole undefeated players after Day 1 at Pro Tour Ixalan! Tune in Saturday to twitch.tv/magic at 8 a.m. PT/11 a.m. ET/2 p.m. UTC to see whether their 8-0 records will propel them into the Top 8 for their shot at a $50,000 first place prize! Live video coverage of Pro Tour Ixalan is hosted on twitch.tv/magic and begins November 3 at 8 a.m. PT/11 a.m. ET/3 p.m. UTC! Take a closer look at the biggest moments from Pro Tour Ixalan in Albuquerque, New Mexico! Mike shares all the info you need to tune in to Pro Tour Ixalan this weekend! Simon breaks down the decks expected to show up in the Standard portion of Pro Tour Ixalan this weekend. The drafters at Pro Tour Ixalan will have had more time to prepare than at any PT in recent years. What will the experts bring to the table? Set your sights on Pro Tour Ixalan this weekend, where immortal glory awaits! Introducing the teams set to compete in this year's Pro Tour Team Series! Remember the World Championship? Forget the World Championship, it's time for Pro Tour Ixalan!